A mummy is a corpse whose skin and dried flesh have been preserved by either intentional or accidental exposure to chemicals, extreme cold or dryness, or airlessness. The best-known mummies are those that have been deliberately embalmed with the specific purpose of preservation, particularly those in ancient Egypt. Egyptian culture believed the body was home to a person's Ka which was essential in one's afterlife. In Egypt, the abdomens were opened and many organs were removed. The emptied body was then covered in natron, to speed up the process of dehydration, and to prevent decomposition. In China, preserved corpses have been recovered from submerged cypress coffins packed with medicinal herbs. Mummies formed as a result of naturally occurring environmental conditions, such as extreme cold (Ötzi the Iceman), acid (Tollund Man) or desiccating dryness have been found all over the world. Some of the best-preserved mummies formed under natural conditions date from the Inca period in Peru. In Egypt, the dead were originally not mummified with the extensive process that happened during the first dynasty. The dead were originally buried in reed caskets in the sand. The searing hot sand caused the remains to dry quickly, preventing decomposition. Later, they started constructing wooden tombs, and the extensive process of mummification was developed to assure that the bodies would not decompose in the afterlife. The mummified individual was placed at his/her final resting place through a set of rituals and protocol. The earliest known 'mummified' individual dates back to approximately 3300 BC, although it is not an intentionally renowned mummy, such as, Rameses II or Seti I. This virtual unknown mummy is on display in the British Museum and has been given the nickname of 'Ginger' because he has red hair. Ginger was buried in the hot desert sand, possibly with stones piled on top to prevent the corpse being eaten by jackals. The hot, dry conditions desiccated and preserved the body. Ginger was buried with some pottery vessels, which would have held food and drink to sustain him on his journey to the other world. There are no written records of the religion from that time, but it likely resembled the later religion to some extent. The desert conditions were a fact of life "and death", so, in any case, some physical preservation would be natural. From the first dynasty onwards, the ancient Egyptians were, unmistakably trying to preserve the bodies of the dead, so their spirit had a body to guide them to the afterlife. The Egyptians also expanded the practice of mummification to animals. Sacred animals central to cults such as ibis, hawks, alligators and cats were mummified by the thousands. Embalmers were given the task to preserve the deceased. Not only did their job require knowledge of human anatomy, they also had to perform rituals at several stages during the process. It is noteworthy that the Egyptians themselves considered embalming so sacred and secret that no record of the process comes from them but only from foreign observers. Soon after a person died, their body was rushed to the embalmer to prevent early decay. 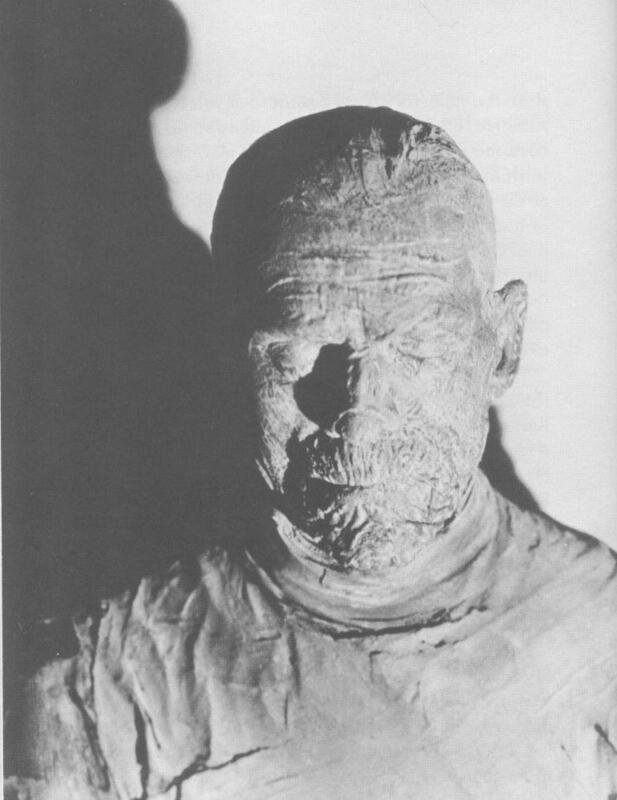 A typical mummification took 70 days in which craftsmen raced to finish the tomb. The first step in Egyptian mummification was the removal of all internal organs which are prone to rapid decay. The brain was removed by breaking the bone at the end of the nose with a chisel and inserting a special hook up the nostrils and into the skull. The hook was swished around, breaking down the brain. The now-liquified brain was poured out of the skull through the nose by tipping the head to its side. Embalmers also removed the stomach, liver, lungs and intestines through a small incision on the left side of the abdomen. According to Herodotus, the man whose job it was to cut the incision was then chased away, for it was thought that the human body was sacred and it was a crime to harm it. The heart was left in place because it was thought to be the centre of the body. The organs which were removed from the abdomen were stored in so called canopic jars, modelled after the four sons of Horus, who would protect the organs, and place them in the tomb during the burial ritual. It was believed the person would need these organs to live in the afterlife. Because the function of the brain was not known at the time, it was discarded. In later dynasties, the abdominal organs were treated and wrapped and returned to the body, but unused canopic jars continued to be placed into tombs. The body was then washed with palm wine. Because of its high alcohol content, it would kill much of the bacteria that had already begun to reproduce. Next, all moisture would be removed from the body by inserting linen-wrapped pouches of natron (a type of salt found on the banks of Lake Wadi Natrun) into the abdominal cavity through the incision. The rest of the body was then covered with natron and left in the heat. The result was a dried-out, but recognizable body. The abdominal incision was then covered with a metal plate bearing the Eye of Horus (wedjat) which symbolically healed it. Finally, the body was wrapped in large amounts of linen, some of which contained spells to help the deceased in their passage to the afterlife. After several stages of wrapping, the body would also be coated in warm resin, before wrapping was continued. The coatings of resin would ensure that the linen wrappings stayed in place. The resins likely included frankincense and myrrh. Finally, the mummy would be interred in varying ways that were dictated by the social status of the deceased. Relatively low-status individuals would simply be mummified and laid in a simple tomb or on a ledge in a larger tomb. Higher-status individuals would be interred in an elaborately decorated case, though perhaps not a stone sarcophagus. The highest-status individuals, such as pharaohs, would be interred in a set of nesting mummy cases and sarcophagi, which were often extremely elaborate. Perhaps the most important burial ritual was the opening of the mouth ceremony. This consisted of a priest touching the mouth of the mummy or mummy case with a hooked stick, symbolically opening the mouth of the mummy so that it could breathe and speak in the next life.